Popular historic sites such as Basilique Notre-Dame de la Garde and Paul Cezanne’s Studio are in your itinerary. Get some cultural insight at Paroisse Cathédrale Saint Sauveur Aix-en-Provence and Basilique Sainte-Marie-Madeleine. Explore Marseille's surroundings by going to Notre Dame du Mai (in Six-Fours-les-Plages), Domaine CROIX ROUSSE (in Puget-Ville) and Aix-en-Provence (Saint Jean de Malte, Foundation Vasarely, & more). The adventure continues: take a leisurely stroll along Old Port, stroll through Chateau d'If, take in the spiritual surroundings of Abbaye Saint-Victor, and see the interesting displays at Mucem. To see traveler tips, ratings, where to stay, and other tourist information, read Marseille itinerary builder. McAllen, USA to Marseille is an approximately 22.5-hour flight. You'll lose 7 hours traveling from McAllen to Marseille due to the time zone difference. Expect cooler weather when traveling from McAllen in February: highs in Marseille hover around 54°F, while lows dip to 37°F. Finish your sightseeing early on the 19th (Mon) so you can drive to Nice. Popular historic sites such as Vieille Ville and La Croisette are in your itinerary. Your cultural itinerary includes sights like Rue d'Antibes and Lérins Islands. Explore Nice's surroundings by going to Garoupe Lighthouse (Phare de la Garoupe) (in Antibes), La Cathedrale Notre-Dame de la Nativite de Vence (in Vence) and Chapelle Des Pénitents Blancs (in St-Paul-de-Vence). And it doesn't end there: contemplate in the serene atmosphere at St Nicholas Orthodox Cathedral, Nice, take some stellar pictures from Colline du Chateau overlook, contemplate the long history of Villa & Jardins Ephrussi de Rothschild, and get to know the fascinating history of Le Suquet. To see other places to visit, ratings, maps, and more tourist information, you can read our Nice trip itinerary builder. You can drive from Marseille to Nice in 2.5 hours. Alternatively, you can take a train; or take a bus. Expect a daytime high around 55°F in February, and nighttime lows around 42°F. Wrap up your sightseeing on the 27th (Tue) to allow time to drive to Avignon. An ancient town center surrounded by medieval ramparts, Avignon is a major city of Provence and a Mediterranean city in the Vaucluse department on the left bank of the Rhône River. Palais des Papes and Amphitheatre (les Arenes) are good opportunities to explore the local culture. Arenes de Nimes and Senanque Abbey will appeal to history buffs. Explore Avignon's surroundings by going to Nuances du Sud (in Beaumes-de-Venise), La Maison Carree (in Nimes) and Eglise St-Trophime (in Arles). And it doesn't end there: snap pictures at Pont d'Avignon, delve into the distant past at Roman Theatre of Orange, do a tasting at Chateau de Beaucastel, and steep yourself in history at Pont du Gard. To see traveler tips, other places to visit, more things to do, and more tourist information, read Avignon holiday planner. You can drive from Nice to Avignon in 3 hours. Other options are to take a train; or take a bus. Expect slightly colder evenings in Avignon when traveling from Nice in February, with lows around 35°F. Finish your sightseeing early on the 3rd (Sat) so you can drive to Carcassonne. Your cultural itinerary includes sights like Carcassonne Medieval City and Cité de Carcassonne. Cathar Castles and Basilica of Saint-Nazaire will appeal to history buffs. Venture out of the city with trips to Chateau de Peyrepertuse (in Duilhac-sous-Peyrepertuse) and Perpignan (Palais des Rois de Majorque (Palace of the Kings of Majorca) & Castillet). There's much more to do: explore the historical opulence of Château Comtal, do a tasting at Chateau Canet Tastings & Cellar Visits, contemplate the long history of Maison des Mémoires, and look for gifts at Jeff de Bruges Carcassonne. To see other places to visit, ratings, where to stay, and tourist information, read Carcassonne itinerary maker. You can drive from Avignon to Carcassonne in 2.5 hours. Alternatively, you can take a train; or take a bus. Expect a daytime high around 57°F in March, and nighttime lows around 41°F. Finish your sightseeing early on the 9th (Fri) to allow enough time to take a train to Toulouse. On the Garonne River, Toulouse is on the site of an ancient Roman settlement, and even today, many of the smaller streets follow their Roman counterparts, while many of the red brick buildings are built in a pseudo-Roman style. Popular historic sites such as Basilique Saint-Sernin and Chapelle des Carmélites are in your itinerary. Get a sense of the local culture at Church of Les Jacobins and Musée des Augustins. 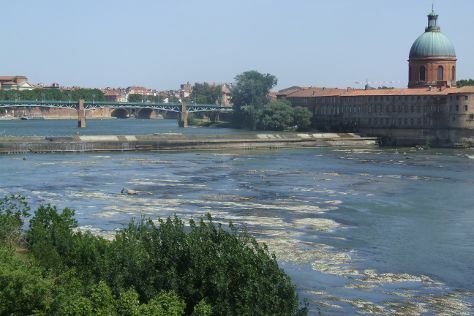 Explore Toulouse's surroundings by going to Albi (Cathedrale Ste-Cecile & Musee Toulouse-Lautrec). And it doesn't end there: make a trip to Place du Capitole, stop by Délices de Tunis, take in the views from Pont Neuf, and take in nature's colorful creations at Jardin des Plantes. To see photos, traveler tips, and tourist information, read Toulouse trip builder. Traveling by train from Carcassonne to Toulouse takes an hour. Alternatively, you can drive; or drive. In March, plan for daily highs up to 58°F, and evening lows to 42°F. Finish up your sightseeing early on the 12th (Mon) so you can travel back home.